In the Outbound Automation by boberdoo system, the static list option allows you to construct a list by either pulling leads directly from your boberdoo system or via a traditional CSV file upload. To create a static list, go to your Lists tab and select Add New. Next, select the static list type and click Next Step. Next you have the option of either building your static list from Leads in your leadsystem or from an uploaded file. For our first example, we will build a static list from leads in our leadsystem. If you would like to build your list from an uploaded file, see “Building a Static List – Contacts From Upload” below. 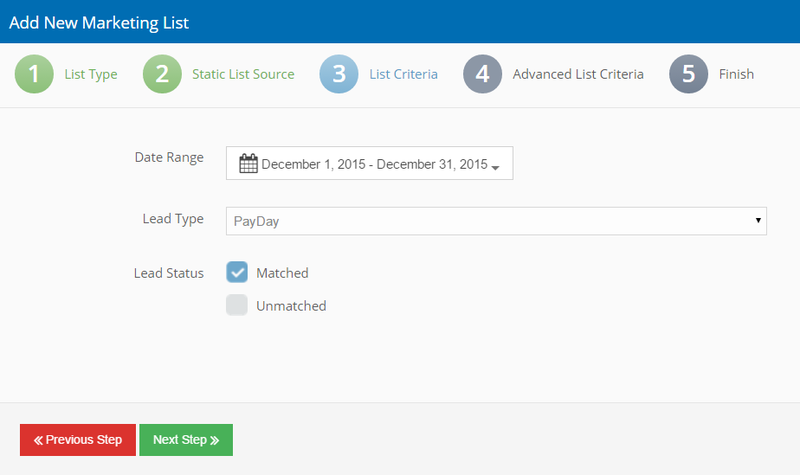 Next, define your list criteria by selecting a date range, lead type and lead status. Your next step is to specify any additional list criteria available for the lead type you selected. This step is optional, but will contain all of the filterable options that appear in your filter sets for the lead type you selected. Once your advanced criteria are selected, click Next Step. Finally, name your static list. Once you click save, a Static List Import table will appear detailing the specifics of the list you are about to create. Click Finish. 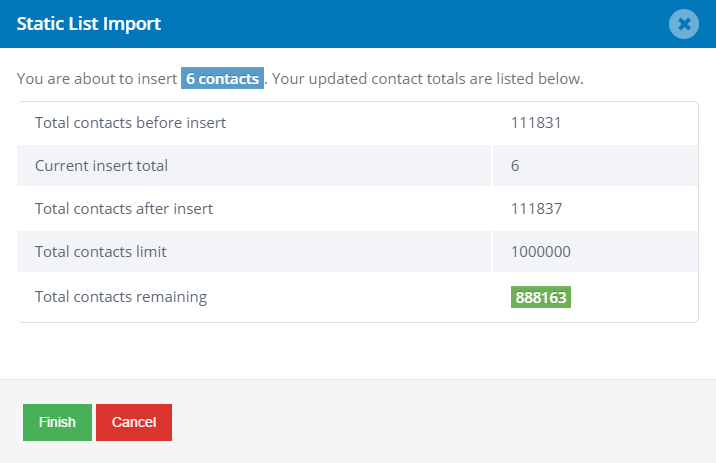 Your static list built from contacts from your leadsystem is now built and ready for use in a static campaign. Next you have the option of either building your static list from Leads in your leadsystem or from an uploaded file. For this example, we will build a static list from contacts uploaded via a CSV file. When building a static list from a file upload, the 3rd step is to select a file to upload. Note: The file you upload must be CSV file formatted like the image below. You can include as many columns or fields as you would like, but the only fields that Outbound Automation can utilize are: First Name, Last Name, Phone, Email, City, State, Zip, LeadID, Lead Type ID, Sub ID, Pub ID and Source. Your next step is to map the columns from your CSV file to the fields available in Outbound Automation. The first row of dropdown menus represents the available fields in Outbound Automation while the second row represents the column headers from your CSV file. Use the field dropdowns to map your fields then click Next Step. Finally, name your static list. Once you click save, a Static List Import table will appear detailing the specifics of the list you are about to create. Click Finish. Your static list built contacts uploaded via CSV is now built and ready for use in a static campaign.